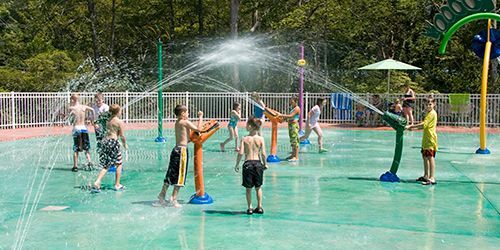 New England's water parks, splash parks, and water slides make a great day trip or even a half-day stop on a New England family vacation. Water rides, twister rides -- the whole works -- are a fun adventure for adults, parents and kids on a summer trip or getaway in New England. Once you dry off and relax, think about the next day’s adventures: Mountain coaster rides? Railroad excursion? Zoo visit? Pilgrims and the Mayflower? 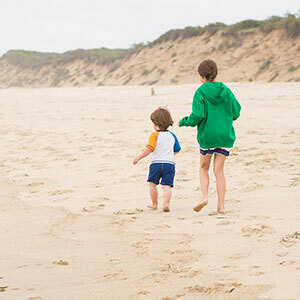 Explore more family activities. New England’s largest Splashpad is included with admission to The Dinosaur Place at Nature’s Art Village! This dinosaur-themed water park is one of Mystic County’s premier attractions. The Splashpad is a zero-depth water playground with water features for every age group. Fun water tables will entertain infants and toddlers for hours, while over 30 dinosaur-themed sprinklers, dumping buckets and water guns will have the older children screaming with joy. The Vortex Superwheel pours thousands of gallons of water down on everyone waiting below. The Splashpad also features a dinosaur “ribcage” waterfall and dueling Tyrannosaurus Rex and Velociraptor-headed water cannons. Seating is available surrounding the Splashpad and changing rooms. Water shoes or flip-flops are required at the Splashpad. Pure Joy. Family Style. Every Splash & Slide. Ho Ho H2O, the Joy Ride Slides, and Poogie’s Splash Pad comprise the water park geared for pre-teen children inside Santa’s Village theme park. Pre-schoolers love the spraying jets of the splash pad; kids over three feet tall have a blast on the three-stories-high Joy Ride Slides; and children of all sizes enjoy the tipping bucket and other features of Ho Ho H2O. The Elfs Lodge serves up satisfying lunches, and houses a gift shop with bathing suits and towels, family-style changing rooms, and restrooms. Use of the water park is included in the general admission to Santa’s Village. 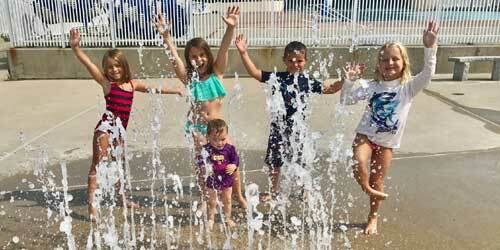 Season: the water park operates Memorial Day weekend to mid October. Whether you’re seeking the thrills of our water slides or looking to relax in our tropical themed retreat, CoCo Key is a fun filled experience for all ages. Open year round, and every day is a balmy 84 degrees! Enjoy our lazy river, splash pad, dip-in theater, arcade and more. Private cozy cabanas and birthday party rooms available for rental. 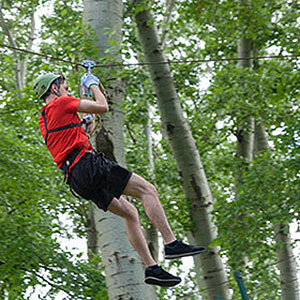 Plan your fun family getaway! Overnight packages also available at our adjacent DoubleTree by Hilton Hotel Boston North Shore. 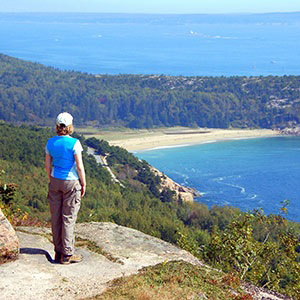 Conveniently located just 19 miles north of Boston, at the intersection of I-95 and Rt. 1, with ample free parking. At Ocean Beach Park, there are so many ways to enjoy the water, you’ll need to have a strategy in hand as soon as you park the car. There’s the popular triple waterslides attraction, where the thrills are only matched by the spectacular views. There’s the 50-meter Olympic-sized swimming pool (with changing rooms and lockers). 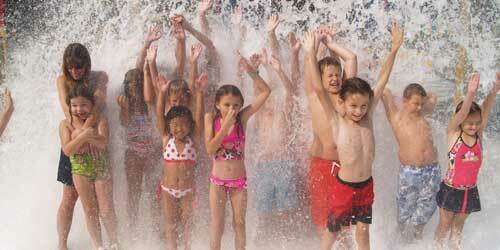 Children under 8 can have a blast dashing in and out of the spraypark. And, of course, there’s the half-mile of carefully groomed sugar-sand beach, wide enough for everyone to be able to really spread out. Even the boardwalk health club overlooks the water. If you’re looking for something a little quieter but still water-centric, a nature walk overlooks beautiful Alewife Cove. After working up a sweat on the amusement park rides at Funtown Splashtown USA, nothing is more refreshing than cooling down while zooming down on the Mt. 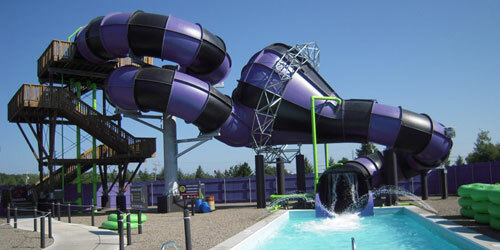 Olympus Water Slides, a half dozen of them and nearly 60 feet high. And there are so many other exciting ways to get wet! By yourself you can slide down on a pad on the Corkscrew or rocket down the vertical tube of Poseidon’s Plunge or the deeply angled ones of Amphitrite’s Challenge. 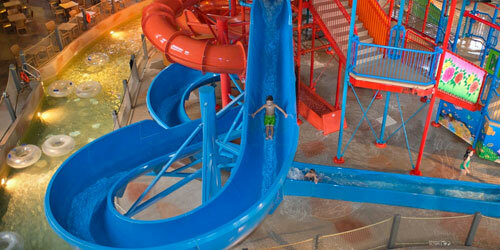 Climb into a rubber raft by yourself or with the whole family and plunge down the Tornado or Mammoth Slides. Or take a breath from all the action. Just slow down, settle down and chill out at the swimming pool. 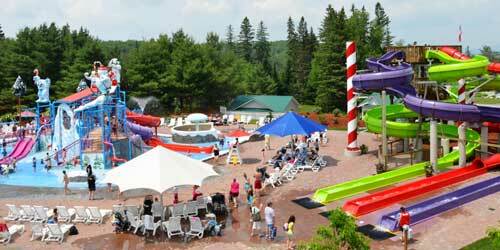 This 26-acre landmark has remained the largest, cleanest, safest and friendliest water park in New England since 1984. With rides and attractions, great dining, places to kick back and relax, you’ve found a special and affordable summer destination. Youngsters can conquer their first water slide at Big Ollie, teens can take on more adventure on Dr. Von Dark’s Tunnel of Terror, and family and friends can enjoy rides and slides together with the family rides, wavepool and Adventure River. 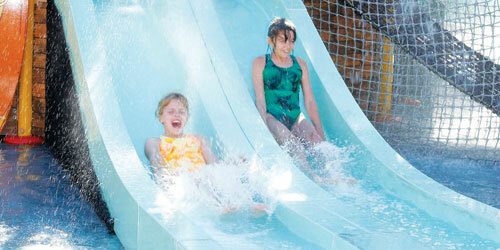 Lots of wet action will keep you smiling as you plunge through curves, tunnels and pools! Relax in style in your own private picnic area or cabana that are perfect options for group activities; group pricing available! Make forever memories here! 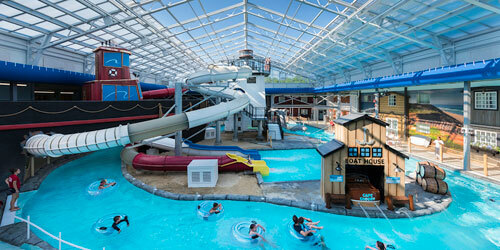 “Splash Away Bay” is the fabulous family water park at Quassy Amusement & Water Park in Middlebury, Conn. Slides, cascading fountains, giant tipping bucket, kids’ splash pad – so many ways to get drenched! New Slide City for youngsters! Plunge more than three stories in the Tunnel Twister slides, one of which is in total darkness! 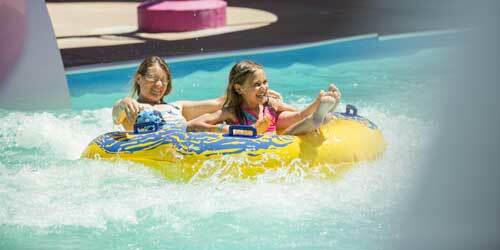 Enjoy the water park with your all-day Quassy wristband, or purchase a Quassy Beach/water park admission separately. Combo passes are less than $30 per person – making Quassy the affordable family choice.